Snap to the ring in handle and carry lead across shoulder when not in use. These leads are made of the most durable leather on the market. Heavy oil treated leather with heavy duty snaps. Snap to the ring in handle and carry lead across should when not in use. 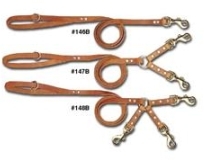 These leads are made of the most durable leather on the market. Heavy oil treated leather with heavy duty snaps.